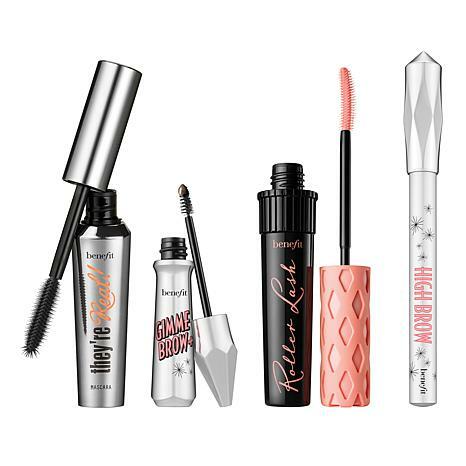 This set contains everything you need for lashes beyond belief and beautifully defined brows. 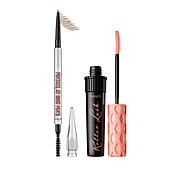 Add drama to your eye makeup with 2 volumizing mascaras, a tinting brow gel and a highlighting brow pencil. Benefit They're Real! Mascara Jet Black .3 oz. Ingredients: Water (Aqua), Paraffin, Polybutene, Styrene/Acrylates/Ammonium Methacrylate Copolymer, Beeswax (Cera Alba), Bis-Diglyceryl Polyacyladipate-2, C18-36 Acid Triglyceride, Palmitic Acid, Stearic Acid, Triethanolamine, VP/Eicosene Copolymer, Acacia Senegal Gum, Hydroxyethylcellulose, Phenoxyethanol, Tetrasodium EDTA, Butylene Glycol, Caprylyl Glycol, Tocopheryl Acetate, Sodium Laureth-12 Sulfate, Glycerin, Potassium Sorbate, Sericin, Calcium Chloride, Sodium Hyaluronate, Tilia Tomentosa Bud Extract, Citric Acid, BHT, Sorbic Acid, May Or May Not Contain: Iron Oxides (CI 77491, CI 77492, CI 77499), Ultramarines (CI 77007), Chromium Oxide Greens (CI 77288), Chromium Hydroxide Green (CI 77289), Titanium Dioxide ( CI 77891). 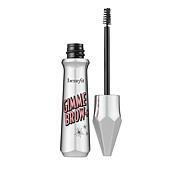 Benefit Gimme Brow+ Brow-Volumizing Fiber Gel Shade 3 Medium .1 oz. Ingredients: AQUA (WATER),MICA, GLYCERYL STEARATE, PENTYLENE GLYCOL, POLYPROPYLENE, MAGNESIUM ALUMINUM SILICATE, PEG-100 STEARATE, PHENOXYETHANOL, POLYACRYLAMIDE, C13-14 ISOPARAFFIN, LAURETH-7, PANTHENOL, GLYCERIN, ALTHAEA OFFICINALIS ROOT EXTRACT, SILICA, CITRIC ACID, POTASSIUM SORBATE, SODIUM BENZOATE. [+/-: CI 19140 (YELLOW 5, YELLOW 5 LAKE), CI 42090 (BLUE 1 LAKE), CI 77007 (ULTRAMARINES), CI 77163 (BISMUTH OXYCHLORIDE), CI 77288 (CHROMIUM OXIDE GREENS), CI 77289 (CHROMIUM HYDROXIDE GREEN), CI 77491, CI 77492, CI 77499 (IRON OXIDES), CI 77510 (FERRIC FERROCYANIDE, FERRIC AMMONIUM FERROCYANIDE), CI 77742 (MANGANESE VIOLET), CI 77891 (TITANIUM DIOXIDE)]. 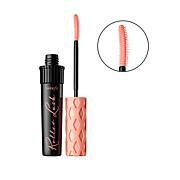 Benefit Roller Lash Mascara Ink Black .3 oz. Ingredients: Aqua (Water), Paraffin, Cera Alba (Beeswax), Polybutene, Bis-Diglyceryl Polyacyladipate-2, Palmitic Acid, Stearic Acid, Triethanolamine, VP/Eicosene Copolymer, Acacia Senegal Gum, Copernicia Cerifera (Carnauba) Wax, Euphorbia Cerifera (Candelilla) Wax, Hydroxyethylcellulose, Silica, Phenoxyethanol, Panthenol, Butylene Glycol, Caprylyl Glycol, Tocopheryl Acetate, Algin, Serine, BHT. [+/-: CI 19140 (Yellow 5, Yellow 5 Lake), CI 42090 (Blue 1 Lake), CI 77007 (Ultramarines), CI 77163 (Bismuth Oxychloride), CI 77288 (Chromium Oxide Greens), CI 77289 (Chromium Hydroxide Green), CI 77491, CI 77492, CI 77499 (Iron Oxides), CI 77510 (Ferric Ferrocyanide, Ferric Ammonium Ferrocyanide), CI 77742 (Manganese Violet), CI 77891 (Titanium Dioxide)]. Benefit High Brow Eyebrow Highlighter Pencil Linen Pink .1 oz. Ingredients: ETHYLHEXYL PALMITATE, SILICA, SYNTHETIC WAX, STEARYL DIMETHICONE, BIS-DIGLYCERYL POLYACYLADIPATE-2, OCTADECENE, HYDROGENATED POLYDICYCLOPENTADIENE, MICA, SYNTHETIC BEESWAX, PENTAERYTHRITYL TETRA-DI-T-BUTYL HYDROXYHYDROCINNAMATE, BHT. [+/-: CI 19140 (YELLOW 5, YELLOW 5 LAKE), CI 42090 (BLUE 1 LAKE), CI 75470 (CARMINE), CI 77007 (ULTRAMARINES), CI 77163 (BISMUTH OXYCHLORIDE), CI 77288 (CHROMIUM OXIDE GREENS), CI 77289 (CHROMIUM HYDROXIDE GREEN), CI 77491, CI 77492, CI 77499 (IRON OXIDES), CI 77510 (FERRIC FERROCYANIDE, FERRIC AMMONIUM FERROCYANIDE), CI 77742 (MANGANESE VIOLET), CI 77891 (TITANIUM DIOXIDE)]. I bought the Medium set for my daughter who raves about a Benefit Cosmetics and the dark/ Shade 5 for myself. I have really thin lashes & brows from years of plucking & waxing and thinning, sparse lashes from aging and health-related issues. Using the mascaras my lashes look full, thick & long. And with the Gimme Brow+ and High Brow Pencil I look like my brows are naturally thick, full & lifted...WOW! Its really simple to use, foolproof. Im so happy I ordered this set! I highly recommend. 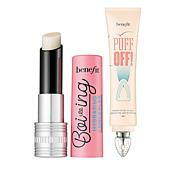 I bought this set for my daughter who raves about a Benefit Cosmetics. She loves the way her lashes look full, thick & long using the mascaras. And her brows are thick & full yet natural looking. She really loves the products and says it was an amazing deal! I also got a set for myself in the dark. I use a lot of differant cosmetics but Benefit Brow is my favorite. Easy to use and looks great. I like it so much I got it on autoship. The mascaras are really remarkable. They dont gunk up and get clumpy, and make my lashes curl and longer. I dont use the highlighter stuff, as I am 70 and pretty simple. Not a dud in the bunch! All products are wonderful and full size. All of them get used daily. Glad Im on auto ship.